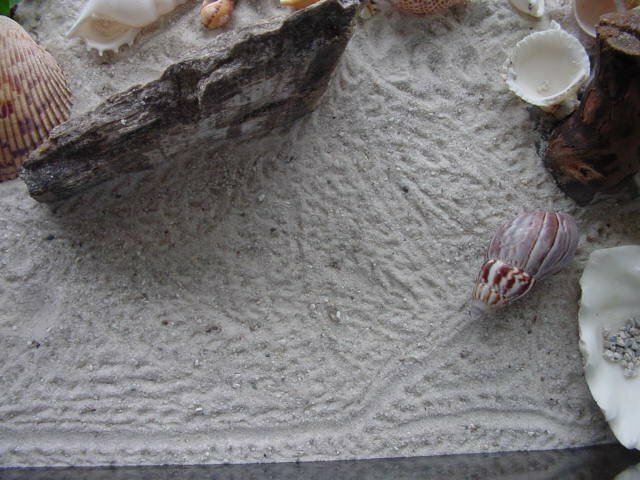 The best substrate that I, and others, have found to use is sand. Playsand is also one of the cheapest substrates and rather easy to maintain. Since hermit crabs love to dig, and sand is what they are use to in the wild, I find that they thoroughly enjoy it. Weekly top cleaning is best. You just scrape access food and dirt spots from off the top of the sand with a spoon or other scooping utinsil, then toss it out and let it go on until it is time for the deep cleaning. Deep cleaning is done about once every month or so, by either replacing the sand or baking the sand after a thorough washing. Baking is done at 350 degrees in the oven for 30-40 minutes. Cool thoroughly before returning the sand to the tank with the crabs. I am sure they will be glad you did. You would hate to burn your pets. Deep cleaning should be done once a month unless you spot clean often and find that the sand is not that bad. The more digging done in the tank by the crabs determins how often you will need to do a deep cleaning as well. When the crabs do a lot of digging, then tend to take food along with them into the new tunnels and eliminate underground as well. Just keep a watchful eye out and be sure things don't get too dirty or moldy in the tank. High humidity can also cause mold, so be sure your tank does not get too humid. A humidity guage is a very helpful item to have in order to determine whether or not the tank is too humid. In above picture, the sand is too dry. To moisten it, add a cup of water to it at a time and mix unitl you get sand that is not wet, but moist enough to stick together when you make a pile out of it. a better way of describing it is that when you push it aside it will not easily fall back down.